Since radishes kept going on sale for really cheap – 4 for a dollar, for example – I decided I could waste a quarter on a recipe that might or might not turn out. Turns out that they’re actually really good braised. And probably roasted too, but I haven’t tried that yet. They become very tender and mellow. I think when the weather gets colder, I’m going to try throwing some radishes in with the roasted veggies I like to make for winter salads. I bet they’ll be good. So, for a really easy side that takes next to no work, I’d definitely try these if I were you. 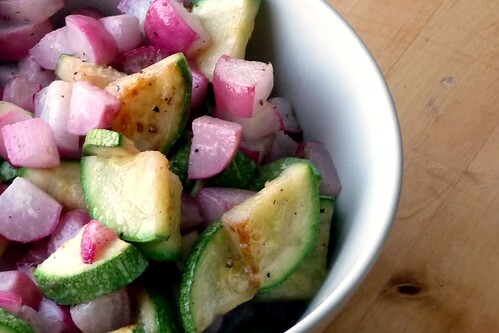 Quarter the radishes and slice the zucchini into thick half-moons. In a deep skillet, melt the butter over medium heat and add the veggies when it’s foamy. Sprinkle over some salt and pepper, toss to coat. Cook until radishes are tender, about 10 – 15 minutes. This entry was posted in american, dairy-free, gluten-free, one-dish, recipes, salad, side, untranslated, vegetable, vegetarian. Bookmark the permalink.